Finally, it's the time to share my first post on a makeup look. Today I am going to share a makeup look which I did a couple of months back when it was spring season in Australia. It is not only appropriate for this spring and approaching summer season but is budget-friendly also because I have used all drugstore or affordable makeup products to create this look. I have used minimal makeup products to make this look ideal for summer because no one likes to load tons of makeup in scorching heat that tends to melt you down. I started off with a well cleansed and exfoliated face and applied 'Jovees Aloevera Moisturising Lotion' which retails for INR 180 and is a light weight and cooling moisturiser with the goodness of sandal and aloevera. It is a very inexpensive and widely available moisturiser which suits oily skin. Then I used Lo'real CC Cream to even out my skin tone. It colour corrects the redness and dark spots and gives you a matt canvas to work on. It is very light weight and hence ideal for summers. I bought it from Melbourne for AUD 13-15. I then applied a loose powder from VOV to remain oil and sweat free for a longer time and to make my makeup last long. This loose powder is available on all cosmetic shops in India and retails for less than INR 200 . After setting my base I primed my eyes with a face primer from Rimmel London which again was bought from Melbourne. This primer is very light and controls access oils and helps my eye shadows to stay longer. Although it is a face primer yet it works equally well under eye makeup too. Then I used a 5-colour eyeshadow palette from LoL which has different shades of green ranging likhaki green, olive green and has different textures also. The eyeshadows are super pigmented and eyeshades are also satin smooth. I bought it for only AUD 3 from KMart Australia. I used olive green eyeshadow which is a gorgeous colour with matt finish from this palette and applied it on my eyelid till my crease line doing a padding motion for maximum intensity. Olive green is a cool colour and I love to use it in summers because it looks so pleasing to the eyes. 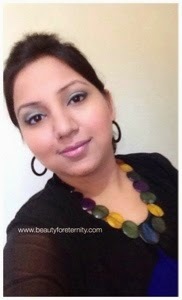 I used a flat eyeshadow brush from Ecotools to apply this colour. I then took a cool toned matt brown colour from my Loreal matte 4 colour eyeshadow palette and blended the olive green gently in my crease area to fade away harsh edges. I used back and forth sweeping motion to blend the two colours together in the area above my crease. Back and forth motion ensures that the colours blends out only where it is required instead of going to places. I highlighted my brow bone with compact powder only because I wanted this look to be subtle with only the olive green standing out. I then lined my lash line using a felt tip pen water proof eyeliner from Boe which is available at Big W stores for only AUD 2 and created a small wing. I used water proof eyeliner to make it sweat proof. The blush I have used on my cheeks is from Models prefer makeup kit which I bought for only AUD 10. This blush is a soft coral on the peachish colour which has fine shimmer particles and imparts a pearly glow to the cheeks. Then I used a pink lipgloss from the brand LOL and available at KMart fir AUD 3. I will post detailed and full reviews of the products mentioned above in a separate post. You don't have to use the same products. The short description of all the products used to create this look will help you to find similar products under different brands. Use the face products keeping your skin type in mind. My skin is combination but tends to get more towards the oilier side in summers. let me know if this tutorial helps you in anyway. I would love to hear from you.